The Indigenous People of Biafra (IPOB) and it's leadership worldwide under the command of Mazi Nnamdi Kanu once again ask the APC government led by Major General Muhammadu Buhari, South East Governors and John Nnia Nwodo to produce our leader Mazi Nnamdi Kanu who has been kidnapped since 14th September 2017 by Nigerian government and her security operatives during the invasion of his compound in Afaraukwu Ibeku Umuahia Abia State. 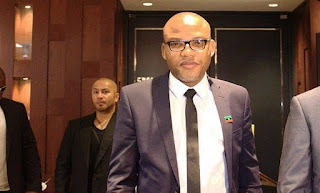 We are asking Major General Muhammadu Buhari, Nnia Nwodo and South East governors to produce Nnamdi Kanu because they or their representatives all participated in countless meetings in Abuja and Enugu where modus operandi of the genocidal Operation Python Dance II was agreed and ratified. It was as a direct result of the invasion of military invasion of the home of Mazi Nnamdi Kanu and massacre of 28 innocent unarmed civilians with many missing that has led us to once again politely ask that our leader be presented to us dead or alive. We have remained patient in the hope that all those with a hand in the disappearance of our leader will do the right thing before now. IPOB would not be held responsible for any direct action concerned citizens may take very soon. The world must know that IPOB as a conscientious organisation, will not allow the abduction of its leader to go unchallenged. It is becoming clear to everybody that Muhammadu Buhari, Nnia Nwodo and South East governors are desperately trying to draw IPOB into armed confrontation and militancy to justify their genocidal clampdown on innocent people of the South East and South South. Should they continue to defy the laws of natural justice and fair play by not releasing our leader, they may get their wish in no distant time. As the architects of Python Dance II, Nnia Nwodo and South East governors are under moral obligation to disclose to Igbo people in particular and Biafrans in general the whereabouts of IPOB leader or have themselves to blame. We are therefore advising all those culpable in the abduction of our leader, his parents and death of dozens of IPOB family members in Abia and Rivers State to please release our leader to us before things get out of hand. The struggle for Biafra independence is a task that must be accomplished whether the collaborators like it or not. If the Nigerian government likes, it can slaughter every being in the whole of Biafraland; Biafra must surely be restored because it has been divinely ordained by God Almighty (Chukwu Okike Abiama) and no man born of a woman can stop it.